Gotta love this cute little girl. I haven’t been playing for a while… Mainly because the Internet connection at home and the work place has not been very stable. So what do I recon? I was surprised to see my old account was still working… I’ve been inactive for so long that I was afraid they already deleted my account. I was happy to find that all my dear characters were still there… I began to remember how badly I use to play this game… I mean, I’ve been playing it for such a long time and yet I was still in the Beginner A level on the International Servers. Since the Philippine Servers are not really all the stable, I decided to play here. And besides, the red afterburners I wanted so badly, are only 88 thousand pang in this server… That’s nearly 65% off the Philippine Server prices..! A friend of mine told me that Level-Up Games (the servers of Philippine Pangya) are “only in it to make a lot of money”. Which kinda hurts… It’s a lot of fun to finally be able to buy cookies for your characters and stuff, but with this kind of treatment… Why would I stay..? 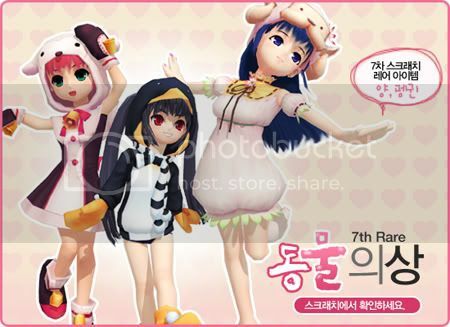 Now, the only thing I actually understand on this ad, is that it’s a “7th Rare”… The rest, I’m pretty sure Pangya Korea Players will be able to understand. I think Hana’s in a Cow costume, Kooh’s a Penguin, and Arin’s a Sheep… Really cute, ne? Listening to: Do As Infinity - Week! I first thought the promo in Pangya Japan was only for Arin… But it apparently has something for Kooh as well. From February 15 to the 1st of March, there’s an offer for new style glasses as well as a new hairdo for Arin. It seems a famous actress(?) named Tokito has a signature hairstyle and glasses, so Pangya Japan incorporated it to the Avatar that looks closest to her (Arin)… Her glasses are available for the 3 female avatars: Hana, Kooh, and Arin. You are currently browsing the archives for the Hana category.